Oh, I'm sorry, were you expecting a luvvy duvvy post today? I truly dislike Valentines Day. I know I’m a luvvy-duvvy romantic girl and I always write cheesy posts and file them under ‘l’amour’ - yes, I have an entire category reserved for love talk - but that’s on a normal day. 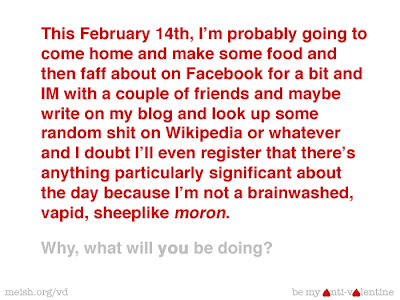 February 14th brings out the beast in me. The way I see it is this; I don't need an official day to tell me to be romantic. I will be romantic when I bloody well want to be romantic, thank you very much. I don’t need coercing into being nice to my boyfriend and wearing lacy lingerie just because the date says so. And frankly I can't think of anything worse than sitting in the middle of a dimly lit restaurant surrounded by tables of loved up couples whispering sweet nothings into each other's ears. Well I've got news for you, loved up couples; those words of endearment are nothing more than involuntary convulsions controlled by the Devil’s Spawn, Hallmark. Indeed, did you know that Saint Valentine actually worked for Hallmark? I wouldn’t mind so much if the holiday was, in fact, a holiday. If we all got a day off work then of course I would embrace Valentine’s Day and all that it brings – including the hideously freaky Cupid and his arrow (fat naked baby with a weapon…comment c’est romantique!) and the vulgar melange of pink and red everywhere you look (my eyes! They're burning with the ugliness of it all! Buuuuurning!). Having said that I still ended up sending FP a card and a somewhat lengthy letter with curly handwriting and yes, I did even dot the occasional ‘i’ with a teeny weeny delicate loveheart. I hang my head in shame. Is it just me, or are the people that "dislike" Valentine's Day more vocal about it than everyone else? I have seen so many people preface their blog entries with "I don't usually like Valentine's Day, but..." that I'm starting to go a little batty myself! I heard on the radio this morning that the average American spends about $70 on their sig. other for Valentine's Day. How do you suppose that measures up to how much we spend for Christmas? And do you think the decorations for V-Day come even close to the extravaganza that Christmas has become??? I will unabashedly say that I love Valentine's Day. I agree with you, Princesse, that I DO NOT need a day designated to "be romantic" or do nice things or buy gifts for my special person, but rather it is one day designated during the year that reminds us romanticism is still important in our world. There should never be anything forceful about Valentine's Day; if you don't want to "celebrate" it, or if you don't have anyone to "celebrate" with (and you know what I'm talking about here, don't you) then there is absolutely nothing wrong with that. Just don't think you're robbing any enjoyment from the rest of us by crossing your arms and pouting, eh? I thought, for some reason, that Valentine's day was on the 15th. That shows how little I care! It's not something I'm used to celebrate and I truly don't care. I find the North American way of celebrating almost every single day in the calendar truly annoying. And I wish the rest of the world didn't follow! Ahhh TD I don't take offense, silly sausage! I HATE the way every holiday is commercial now, including christmas and halloween, but I suppose I'm less against xmas because it is a real holiday that we get off from work and school (can't complain about that, can I?) and I suppose because I've celebrated that holiday my entire life. Here in Britain kids don't celebrate Valentines Day. I have heard - but correct me if I'm wrong - that in the states kids make their classmates cards and little trinkets and some even buy their classmates presents!! The idea behind St Valentines, I admit reluctantly, is good and true and nice but I'm afraid the amount of crap and cards and adverts on TV etc just turns many of us off and makes us angry. And also xmas, halloween etc can be embraced by all (unless religion stops someone) but Valentines Day, at least in Europe, is only for couples. What about singletons? Do they really need to walk into a supermarket and be bombarded with cards galore and presents and flowers and chocolates to remind them that they are alone? I can totally see it from your point of view though, but maybe it's a culture thing? Americans do seem to embrace all holidays, and they enjoy doing it but Britain and France are having it pushed on us by TV, shops, radio, newspapers, everywhere! I guess many of us are rebelling! But don't worry, I don't want to take away the joy for anyone else, so I hope you and your wife spent a lovely day together yesterday! First off thanks for your comment. I always appreciate it when someone takes the time to read what I write. As for this post I AGREE. V-Day is not exactly my favorite holiday. It just remainds us single people that we're single, and reminds people in relationships to go out and buy impersonal items. Couldn't agree more ... although maybe if I had actually received any cards then I would be thinking differently! I think people try to get themselves into a festive spirit over Valentine's day in the US because it falls in the middle of the vast, bleak wasteland that is the winter season... after Christmas and New Year, Spring still a long way off... no end in sight. But honestly, almost everyone scoffs at the Hallmark holidays. I think that when it all comes down to it, people end up buying chocolates and flowers just because they're EVERYWHERE and what if you're the one half of your couple who doesn't do anything? Oooh, the pressure. Happy Belated day of Luuuurrrve, Princess! haha! yes it is rather pressure-filled isn't it? I have to discuss whether presents and cards will be bought beforehand with FP then neither one of us feel embarrassed when the other hands over a bling bling watch and they smile awkwardly as they pass over a measly box of chocolates from the local Asda. Communication is the key! Thanks for all the comments people!